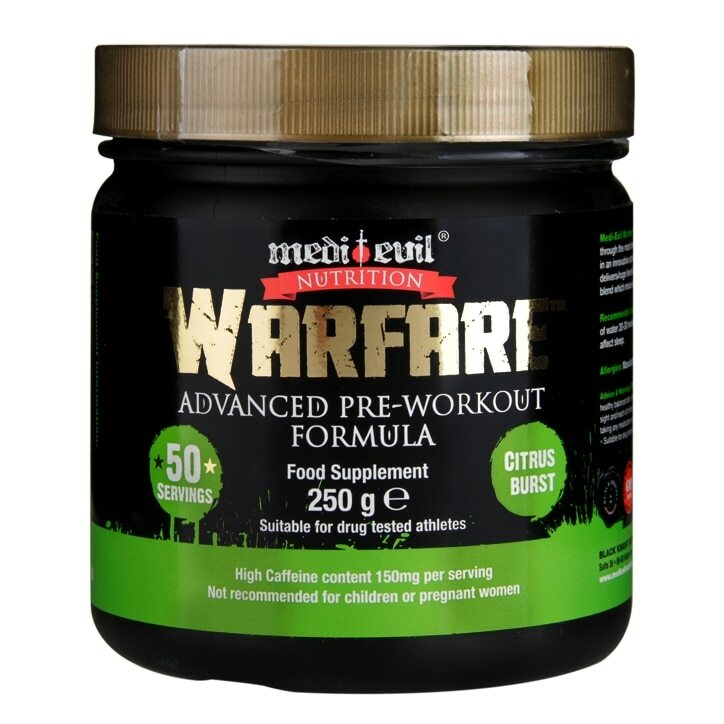 Medi-Evil Nutrition Warfare is a hard hitting advanced pre-workout formula designed to devastate the most intensive workouts. Warfare contains the highest quality active ingredients in an innovative active matrix that makes Warfare a product that is one of a kind. Warfare delivers huge levels of Arginine AKG, Beta-Alanine and Beetroot extract in its market leading blend which mixes easily with water. For best results take one to two scoop(5-10g) with 200 -250ml of water, 20 - 30 minutes before workouts. Arginine AKG, Beta‐Alanine, Citrulline Malate, L‐Arginine, Flavour, Beetroot Extract, Caffeine, Niacin, Panax Ginseng, Bioperin. This product is a food supplement and should be used in conjunction with food as part of a healthy and balanced diet and not as a substitute. This product is intended for adults and should be stored out of reach of children. Do not exceed recommended daily intake. Not suitable for children or pregnant women. Always consult the label before use. Medi-Evil Warfare Pre-Workout Citrus Blast is rated 4.3 out of 5 by 3.